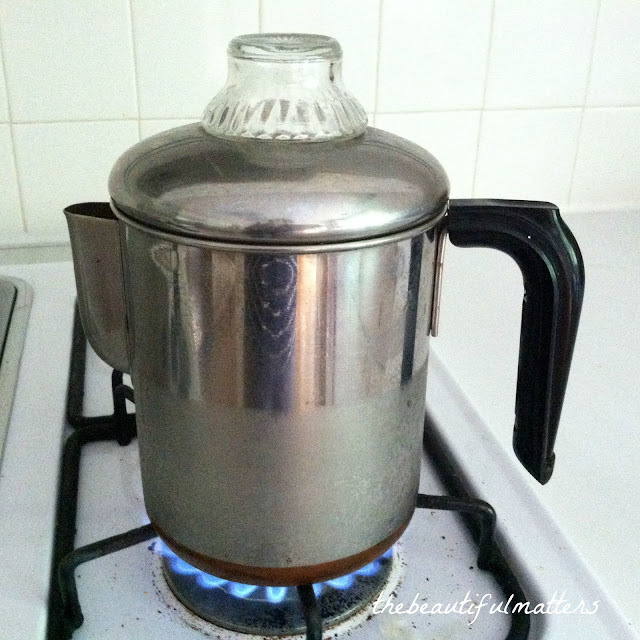 We have a Keurig, and it makes great coffee, but I do occasionally like to make a pot of old-fashioned stove-top percolator coffee. I found this percolator on eBay a few years ago. It has a glass top thing-y. I don't think they make the glass ones anymore; they're all plastic, and tend to fall out when coffee's being poured (or so I've heard). Taking the time to grind whole coffee beans makes a real difference in taste . . .
Not as fast as a Keurig, but certainly worth the wait. And this recent find of a teacup looks perfect for a 1960s-type cup of coffee. Very retro. I love the gold stars, and the pink amps up the cute factor . . . I have just started an online course through Hillsdale College, Great Books 102. I'm excited about the material, and already feel quite intellectually elevated! I'll share more next post. Joining Rose Chintz Cottage for tea coffee. Hi Deborah, I love your old fashioned perculator! I have one just like that from my mother in law. I would love it you stopped by and shared this at our Cooking and Crafting with J & J party. What a cute perculator! 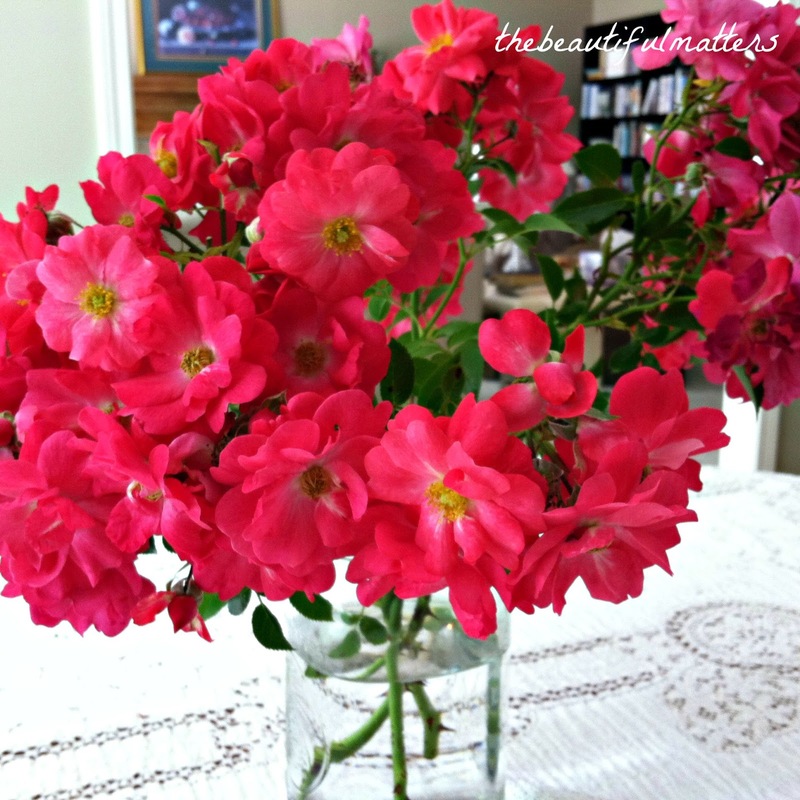 Reminds me of my mom's. My mother used to perculate coffee when I was growing up. Every Saturday night we would all watch a fav TV show and then she would do my hair for church while my brother and father watched the hockey game. After my hair was done, she would pour us each a cup of coffee. It was quite a novelty for my little brother and me and of course our coffee had lots of cream and sugar in it. Fond memories! Your teacup is a cute one too with the stars and pink band at the bottom. Thanks for joining me for tea and enjoy your week. 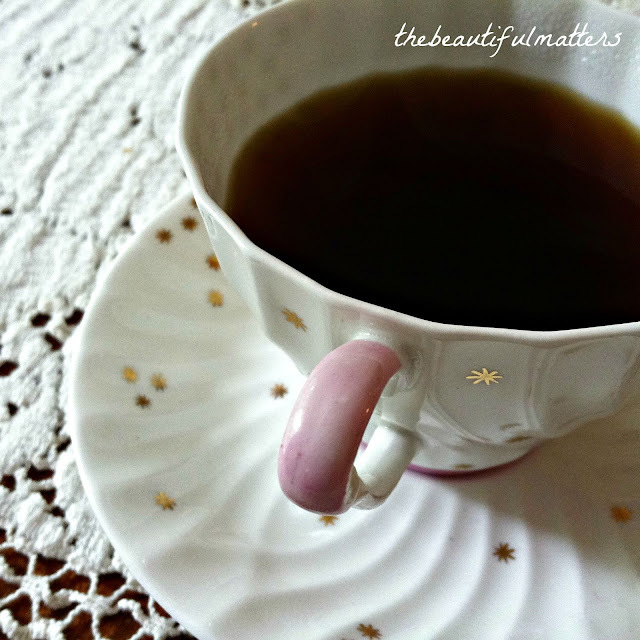 Love your retro teacup! I've never been a coffee drinker, but it looks perfect for tea too! Love the vintage coffee pot! Now that does sound like a treat! Have you ever put an egg shell in with the beans? I remember folks doing that when I was a child. Guess that it makes for a smooth cup of coffee. Darling coffee cup! Oh my stars! What an adorable teacup! Very sweet coffee cup and I love the vintage percolator. Mama had one like this when I was a child. I was interested to see Vee's comment above, too! Those old coffee pots are great! I love your vintage coffee set, Deborah! The percolator is so cute and your retro cup is charming! I love the pink rim! We had a similar coffee perk at home until my mother bought an electric one. 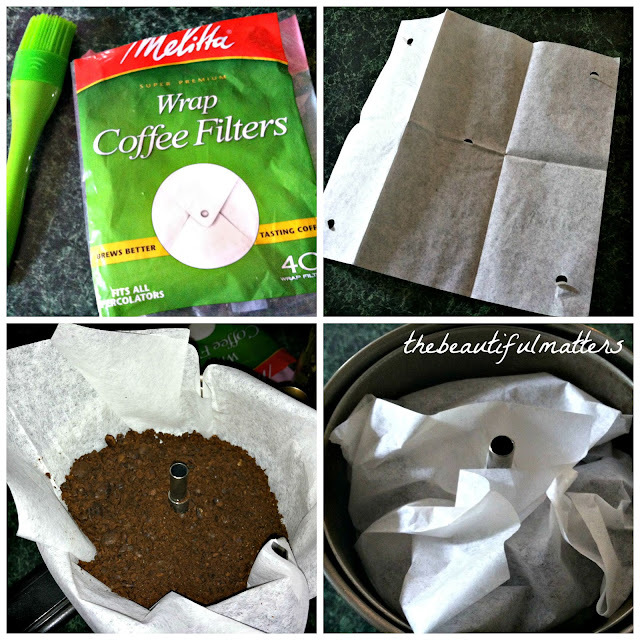 The filter wraps are interesting, never seen them. I used to grind fresh coffee beans every morning until we got the Keurig and I think we're all pretty much using one of them, aren't we? A sweet cup for your coffee Deborah. You sure do bring back very fond memories for me from my childhood as we had one like that. Don't think it was a stove top but an electrical that got plugged in. Always messy for cleaning up that filter insert. 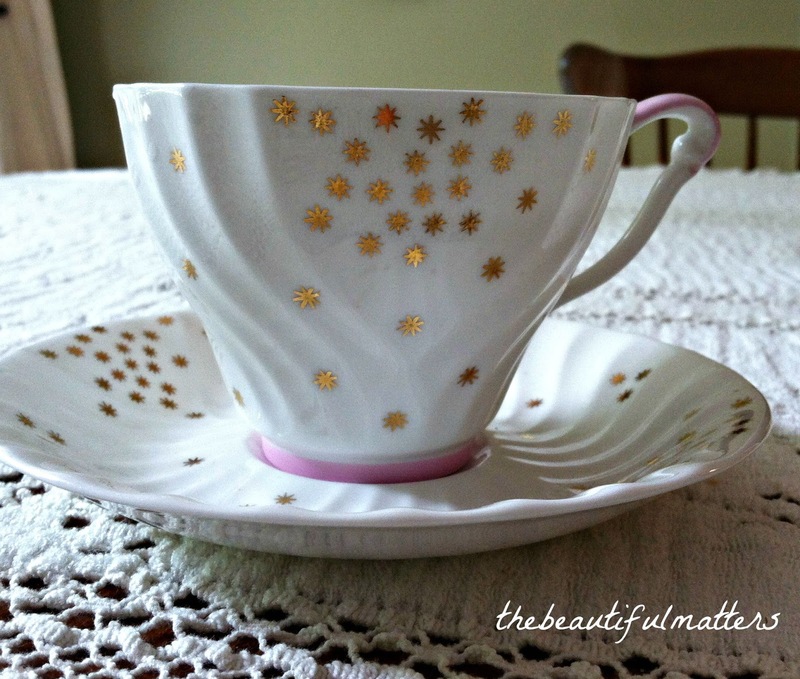 Love the teacup and saucer - so pretty! My Daddy had a percolator very much like yours. He loved to make coffee in that pot. He also liked his coffee strong enough to walk across the table! Little wonder I never got the coffee bug! Love the teacup -- perfect retro feel. Happy Tea Day! Hi Deborah, nothing better then fresh old fashioned brewed coffee in the old style stove top peculators. My parented had this for years when I was growing up.They had the glass pot and you could see the coffee brewing. Love your darling teacup. Congrats on the class. It sounds exciting. 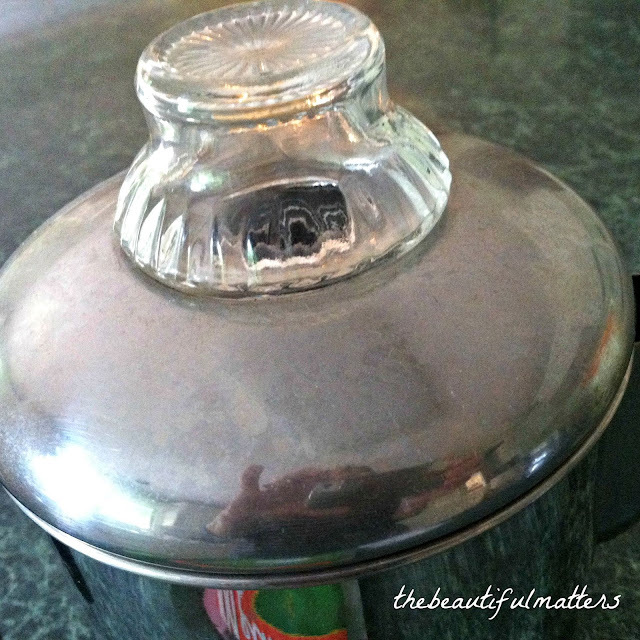 Awwwww I love the pic of the retro percolator, Deborah! Your teacup is such a pretty one, and like you, I love the retro design of it. That would make sipping much more fun! I look forward to hearing more about your online course. What a fun coffee pot! I love the taste of a good percolator. I've got a popcorn popper (stovetop) with a glass top like that. The tea cup -- I love that sweet shape. Reminds me of childhood. Love the cup! We have a similar pot - we used it during Super Storm Sandy. How good the coffee tasted!